CHICAGO -- The fatal stabbing of a hairstylist in Chicago was part of a sexual fantasy hatched in an online chatroom between a Northwestern University professor and an Oxford University employee, whose plan included killing someone and then themselves, prosecutors told a Cook County judge at a bond hearing for the men. An Illinois prosecutor shared disturbing new details about the July 27 slaying, describing to the court Sunday how Trenton James Cornell-Duranleau, the 26-year-old boyfriend of since-fired microbiology professor Wyndham Lathem, was stabbed 70 times at Lathem's Chicago condo and with such brutality that he was nearly decapitated. His throat was slit and pulmonary artery torn. 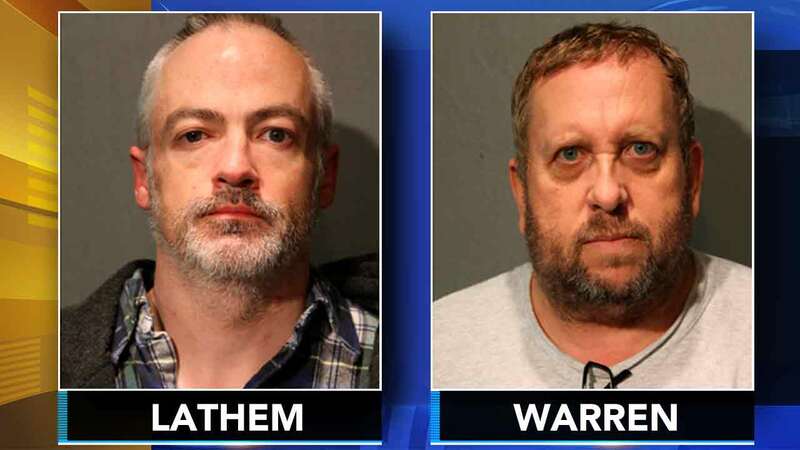 Lathem, 46, had communicated for months before with Andrew Warren, 56, about "carrying out their sexual fantasies of killing others and then themselves," Natosha Toller, an assistant Cook County state's Attorney, told the court. While the prosecutor used the plural in talking about the alleged fantasy to kill, she did not say there were other victims. Judge Adam Bourgeois Jr. at one point shook his head in apparent disgust as he listened to the prosecutor offer a chilling narrative of the slaying. He later deemed both men potentially dangerous and flight risks, ordering them to remain in jail pending trial on first-degree murder charges. "The heinous facts speak for themselves," he said. Lathem and Warren - a British citizen employed as a financial official at the Oxford, England, university - were dressed in their own clothes Sunday at their first court appearance in Chicago. They stood calmly, their hands behind their backs, as the prosecutor and judge spoke. Lathem paid for Warren's ticket to travel to the United States and he picked Warren up at Chicago's O'Hare International Airport a few days before the killing, the prosecutor said. On July 26, one day before the killing, Lathem booked a room for Warren near the condo, Toller said. Cornell-Duranleau, a Michigan native, had been asleep in Lathem's high-rise Chicago condo when Lathem let Warren into the 10th-floor unit around 4:30 a.m. on July 27 - treading carefully so as not to wake the victim. As Warren stood in a doorway, Lathem crept up to Cornell-Duranleau and began plunging a 6-inch drywall saw knife into his chest and neck, Toller said. Lathem had told Warren to take video of the killing using his cellphone, but Warren did not end up recording it, the prosecutor said. When Cornell-Duranleau awoke, he began screaming and fought back; Lathem yelled at Warren, asking him to help subdue Cornell-Duranleau, the prosecutor said. Warren ran over to cover the victim's mouth, then struck him in the head with a heavy lamp in an attempt to silence him, Toller said. As Lathem continued to stab the victim, Warren left the room and returned with two kitchen knives, she said. Warren bent over Cornell-Duranleau and joined Lathem in stabbing him, the prosecutor said. At one point, the victim bit Warren's hand as he struggled to fight off the attack. She said the victim's last words were to Lathem: "Wyndham, what are you doing?" While prosecutors said Lathem and Warren had concocted a plan to kill themselves after the stabbing, Toller did not say why they never followed through with it. After showering, Lathem and Warren left the apartment an hour after the stabbing began, the prosecutor said. They surrendered to California authorities on Aug. 4 after an eight-day manhunt and were recently returned to Illinois. The stab wounds to Cornell-Duranleau included 21 to the chest and abdomen, and 26 in the back, as well as multiple cuts on his hands. Cornell-Duranleau's lungs were also both punctured, and there were wounds to his colon, spleen and liver. After leaving the apartment and renting a car, Lathem on the same day left an anonymous $5,610 donation - in cash - at the Howard Brown Health Center in Chicago in the name 'Cornell-Duranleau.' They then drove to Lake Geneva, Wisconsin, and, 13 hours after the first payment, Lathem went to its public library and wrote a $1,000 check as a donation, also in the victim's name, the prosecutor said. Toller said Lathem, while on the run, sent a video message to his parents and friends, admitting to the killing and telling them "he is not the person people thought he was." Lathem's lawyer, Barry Sheppard, said in a brief statement to reporters after the hearing that people shouldn't "engage in a rush to judgment." He said his client had led "a life of unblemished ... citizenship," which included academic work on the bubonic-plague virus. Warren spoke briefly when the judge asked if he wanted a British diplomatic office to be in contact. "No," Warren said. For the bond hearing, Warren relied on a public defender, who did not comment later. The Cook County state's attorney's office said Monday the next court date will be Sept. 8. The bond-court judge had previously mentioned Tuesday as a possible court date. The date in two weeks will be a preliminary hearing, the state's attorney's office said, giving prosecutors another opportunity to reveal more of their evidence.